Launch of the comedy ‘The Internship’ with Vince Vaughn and Owen Wilson has made #internships a trending topic on the net. We know you don’t always have to wear funny hats to get an internship but once you get one, how do you turn that internship into a full time paid position? The sole aim of an internship is to gain an insight into your role and industry, learn new skills and create contacts in order to make you more attractive to potential employers. Seriously consider if an internship is worthwhile and you are able to gain the skills you are looking for, especially if it is unpaid. That said, always be open to learning new things, not every internship can be tailored to your exact needs. According to CEO of ‘Intern Queen Inc.’ Lauren Berger, you need to give a great impression to your colleagues and supervisor to turn an internship into a full-time role. That impression has to last to the very end. 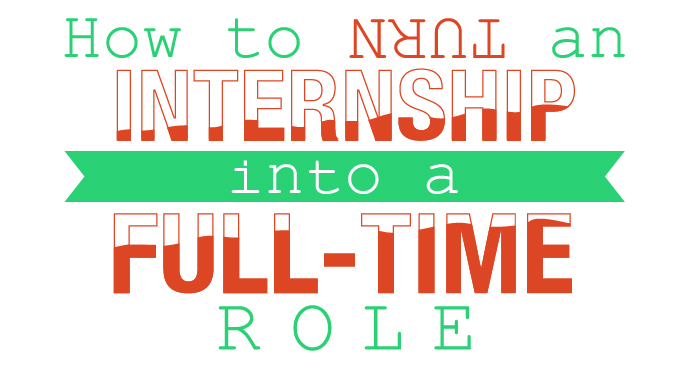 Lauren says, “It’s not about the first day — or even the second day – of your internship. It’s about day twenty, when most interns begin to wear flip-flops to work and look sloppy.” How disappointing would it be if on the day the person making the final decision to hire you walks into the office and your shirt has a coffee stain from last week? Bad news. Lauren also suggests getting to work before your boss and having all the materials at hand to complete your tasks. Similarly, showing initiative during an internship can also ensure that good impression lasts. Steph Auteri, who runs the internship program at yourtango.com says she will be super impressed if an intern seems to be “asking to sit in on meetings, volunteering to help out on other projects (both menial and large), and throwing out new ideas.” Ask to take more responsibility, with permission of course, you don’t want to step on any ones toes. Steph also adds that providing you have completed your tasks and have been a super intern, employers will be more than willing to bend over backwards to turn your internship into a full-time role. So don’t be afraid to ask questions, ask for insights, job leads or even contacts to help you along the way. Another way is to network and build your contacts. Randall S. Hansen, author of ‘Making the Most of Your Internship(s)’ advises, “One of the key tools of job-hunting is utilising your network to find your next career step. Build professional relationships with your supervisor(s) and other managers in the organisation”. Even if the company you are interning for doesn’t have a full-time role for you, your colleagues may know a company that does. They have been in the industry much longer than you. As long as you put the work in, show you are dedicated and have a strong work ethic; it isn’t impossible to turn an internship into a full-time role. You just need to utilise your contacts, show initiative and most of all, enjoy the work you are doing. If you really are not enjoying your work, ask if you can get involved in other aspects of the company and if not, at least you know which path you don’t want to go down. This entry was posted in General Posts and tagged full-time role, internship application, internship placement, internship position, paid summer internships, post graduate internships, unpaid internships. Bookmark the permalink.